For months we have been communicating back and fourth with the team at McBride Charles Ryan, when we got word that the Australian based architecture firm was building a "secret" house in Melbourne - we were instantly intrigued. Until recently, The firm has remain tight lipped about the project, but now we are seeing the full scope of the build. 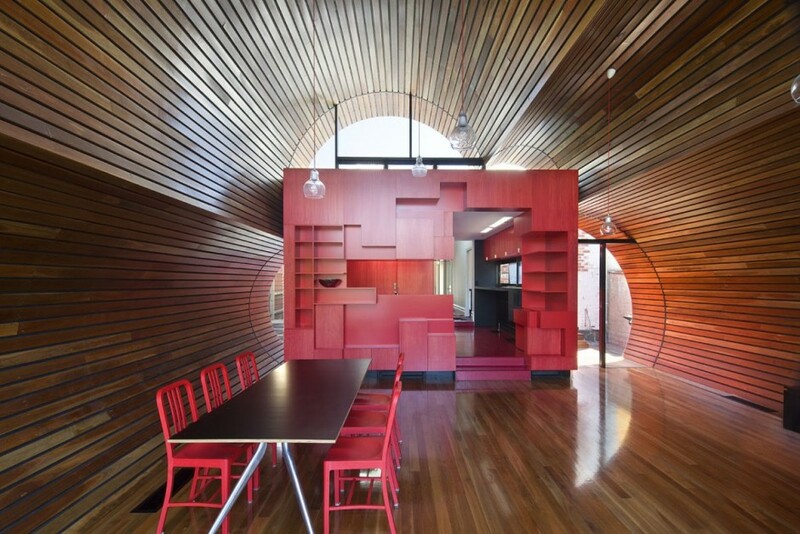 The Cloud House is a highly captivating addition and renovation to a double-fronted Edwardian house in area of Fitzroy North. The century old home had seen its fair share of renovations through the years, which inspired the owner to leave his own stamp. Enter McBride Charles Ryan, who designed the home in three parts. The team at McBride Charles Ryan explained that this three part technique allowed "for a sequence of distinct and unexpected episodes, with glimpses previewing oncoming spaces and experiences as you move through the home." The owner of the home has a great respect for the neighborhood, therefore a decision was made to keep the street facade untouched. Beyond the facade, the design of the home changes as you move through it, in order to create unexpected experiences. "The spaces within the original structure are largely white in color, united by exotic floral hallway carpet," the team noted. "The journey through the space is followed by encountering a disintegrated red-colored ‘box’. This is the kitchen, at the heart of the property, which acts as a bridge linking the major spaces. A cloud-shaped extrusion is the unexpected final space. 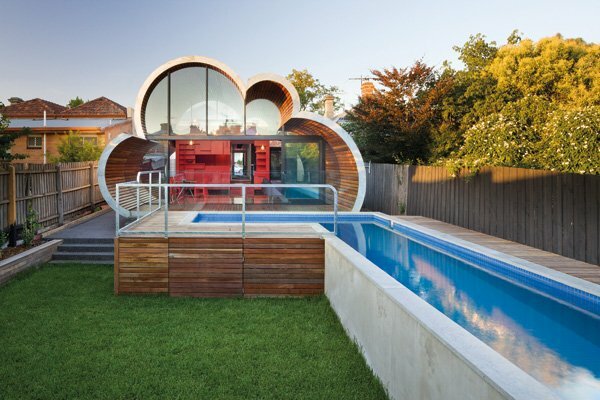 Following the form of a child-like impression of a cloud it is a playful addition where family and friends can eat and have fun surrounded by the curved form." The architects did face the challenge of having setback regulations on the site, but the regulations did not determine the form of the 'cloud' structure because it can not be viewed from the street. The team carried on explaining that "the extrusion creates a dramatic interior language where walls merge seamlessly with the floor and ceiling. The craftsmanship is remarkable throughout; it has a sense of care one typically associates with the work of a cooper or wheelwright. While the geometry is playful, the extrusion is essentially a contemporary barrel vault. It is our hope that this cloud has a ‘silver lining’."